Washington, D.C., December 5, 2011 – India's "peaceful nuclear explosion" on 18 May 1974 caught the United States by surprise in part because the intelligence community had not been looking for signs that a test was in the works. 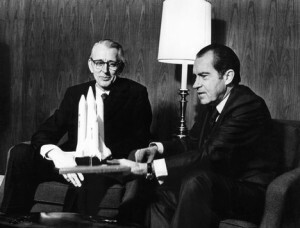 According to a recently declassified Intelligence Community Staff post-mortem posted today by the National Security Archive and the Nuclear Proliferation International History Project, Nixon administration policymakers had given a relatively low priority to the Indian program and there was "no sense of urgency" to determine whether New Delhi was preparing to test a nuclear device. Intelligence "production" (analysis and reporting) on the topic "fell off" during the 20 months before the test, the analysis concluded. In early 1972, however—two years before the test—the State Department's Bureau of Intelligence and Research (INR) had predicted that India could make preparations for an underground test without detection by U.S. intelligence. Published for the first time today, the INR report warned that the U.S. government had given a "relatively modest priority to … relevant intelligence collection activities" which meant that a "concerted effort by India to conceal such preparations … may well succeed." The post-mortem, the INR report and other new materials illustrate how intelligence priorities generally reflect the interests and priorities of top policymakers. The Nixon White House was focused on the Vietnam War and grand strategy toward Beijing and Moscow; intelligence on nuclear proliferation was a low priority. Compare, for example, the India case with that of Iraq during 2002-2003, when White House concerns encouraged—some say even compelled—intelligence producers to cherry pick raw information to demonstrate the development of WMD by the Saddam Hussein regime. INR prepared its India report at a time when secret sources were telling U.S. intelligence that New Delhi was about to test a nuclear device. The "small spate" of reports about a test had such "congruity, apparent reliability, and seeming credibility" that they prompted a review of India's nuclear intentions by INR and other government offices. In the end, government officials could not decide whether India had made a decision to test although a subsequent lead suggested otherwise. According to the intelligence community's post-mortem, obtained through a mandatory review appeal to the Interagency Security Classification Appeals Panel (ISCAP), one of the problems was that intelligence producers were not communicating with each other, so the "other guy" assumed that someone else was "primarily responsible for producing hard evidence of Indian intentions." The analysis was especially critical of an August 1972 Special National Intelligence Estimate for its "waffling judgments" on Indian nuclear intentions.